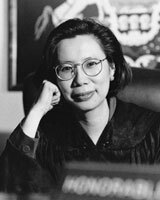 The Honorable Ida K. Chen, recipient of this year’s AAAL Distinguished Public Service Award along with Osvaldo Aviles, will present a personal account of her encounters with language issues and how they led her to address language access in the courts. She will relate how she came to the conclusion that the courts, working alone, are unlikely to deliver justice, and began to seek out the support of others in building capacity for the Philadelphia courts. Judge Chen will discuss how her work is informed by her belief in the power of language and the indispensable role it plays in a just society. Judge Chen is the first Asian American female judge to serve in Pennsylvania and the first Asian American to serve on the Philadelphia Human Relations Commission (PHRC). Additionally, she previously served as a Trial Attorney with the U.S. Equal Employment Opportunity Commission (EEOC), and as a member of the Pennsylvania Interbranch Commission for Gender, Racial & Ethnic Fairness (from 2005-2010), promoting the equal application of the law for all individuals throughout the Commonwealth of Pennsylvania.